Now I know you think that yogis don’t drink coffee- or maybe shouldn’t- but there are some raging coffee addicts among the yoga population. An acquaintance of ours is a die hard ashtanga yogi and very austere A type person who used to preach to us the ills of the dark bean- until he found out his Guru particularly loved coffee. 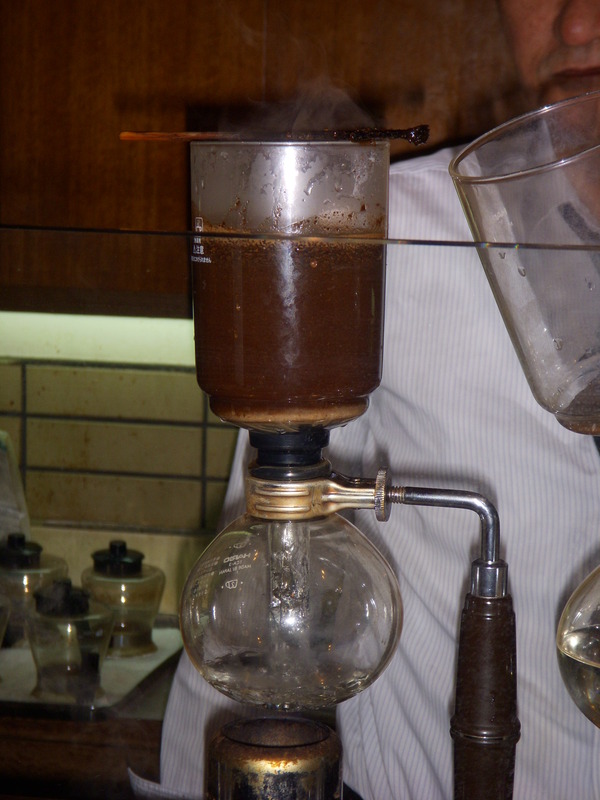 He now writes lovingly about his morning Mysore coffee in his blog! I try to limit myself to one cup a day- some days none- but when I am in Japan I always have that one morning cup of java (actually afternoon cup of java if you take in the time change). 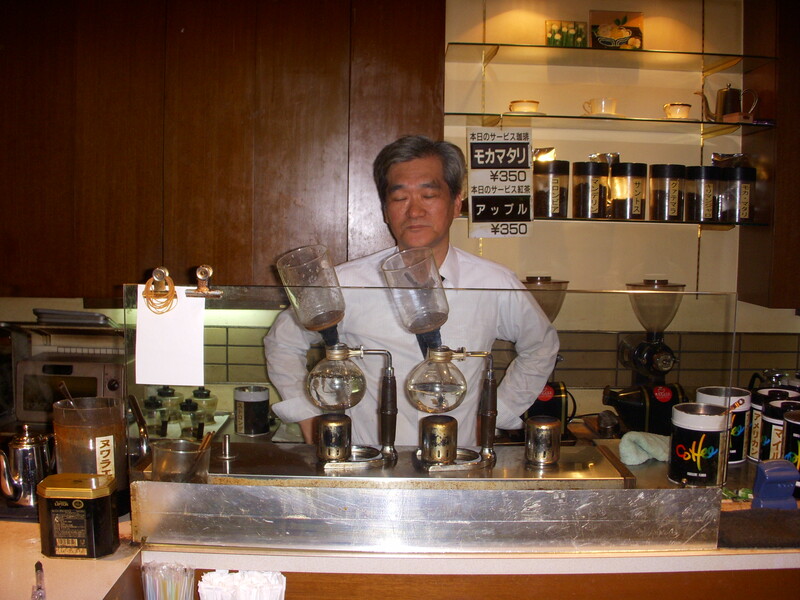 Coffee in Japan is particularly good- ask anyone who has been there. They choose a medium roast and brew it to piping hot perfection without that terrible over roasted bitterness that Starbucks has. I am sorry if you are a Starbucks fan- but I honestly abhor their coffee. I go for the green tea soy latte when I venture there- no syrup. O ne of my favorite coffee spots is in Osaka in a neighbourhood known as Hon Machi. I have been going there for years for my sinful layover breakfast. 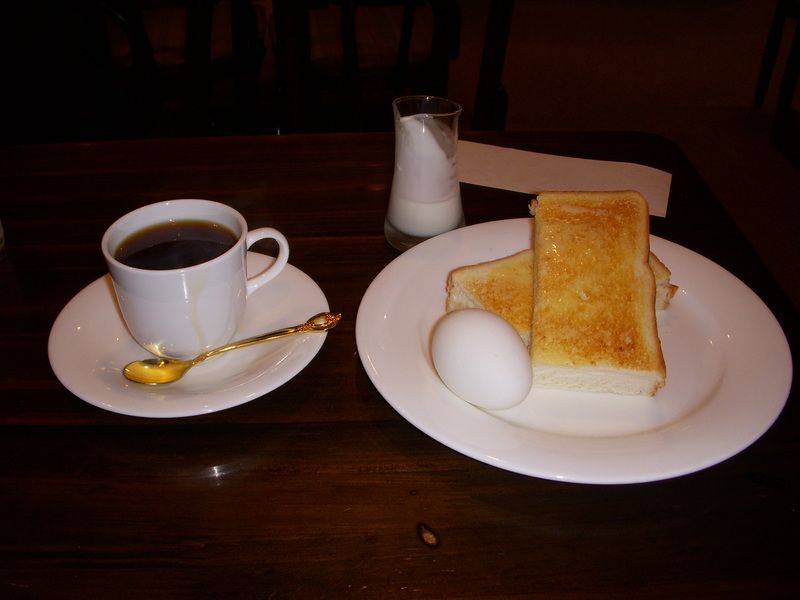 White toast so thick and soft it melts in your mouth, lathered in real butter and served with a hard boiled egg- and of course coffee- all for the whopping price of $3.50. In Japan you can have your morning coffee “hotto” hot or “aisu” iced. I usually go for the “hotto” but “aisu” is nice in the summer when it is 38 degrees and 100% humidity there- ugh. A few weeks ago the cigarette smokers at the front of the coffee shop pushed me further into the back of the cafe where there were few patrons. That is the first time I saw my wonderful morning coffee being made-it was delightful! 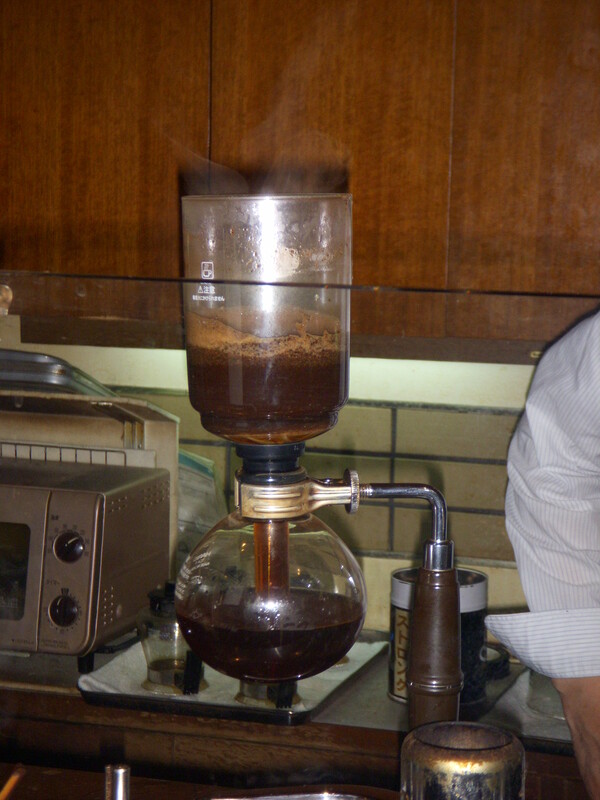 Rather than the conventional coffee machines or espresso machine there was a simple science experiment going on. 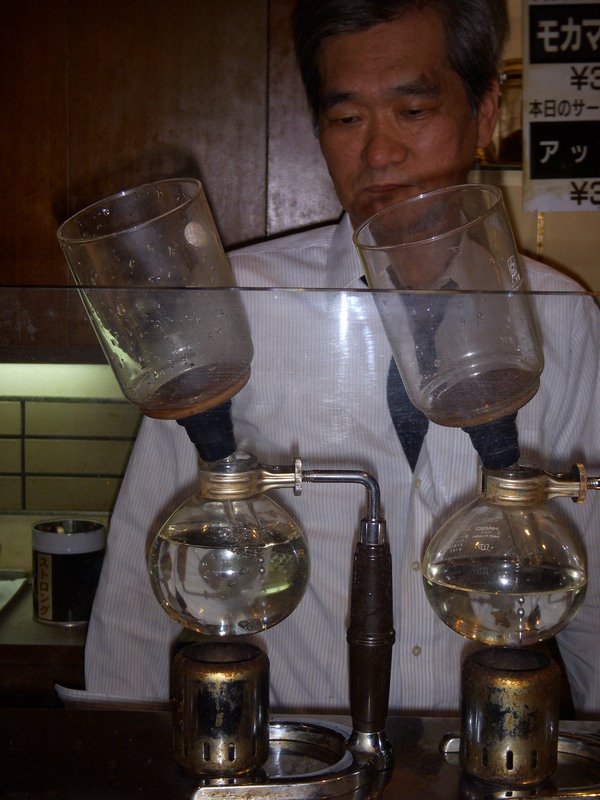 The “barista” had two glass beakers in front of him over little gas burners. He would receive an order and then carefully start to warm a beaker of water. He would plunk a siphon contraption into the top of the beaker and just watch and wait. When the water boiled to a certain point he would then caefully measure off a few teaspoons of ground coffee and softly pour it into the top of the siphon and give it a little pull and whoosh- the water would rush back up the siphon to mix with the coffee. He would give a little stir- again watch and wait and then move the beaker off the flame and whoosh– the coffee minus grounds- rushed back into the bottom of the beaker. He then poured it into a waiting coffee cup or tall glass of ice. Like I said- delightful! After seeing the creative force behind my morning coffee I sat with a little more reverence in front of my breakfast. I enjoyed every single sip and savour- everything was perfection- done with great consideration and artistry. Truly it was the yoga of coffee.